I have only vague memories of pubs in the 1990s given that I was only 14 when they finished. Those memories are dominated by red faux-velvet upholstery tacked down with brass buttons, smoky plumes emanating from the mouths of stubbled blokes watching rugby players in baggy shirts, and lots and lots of things made of copper hanging from fireplaces, beams and any old hook. 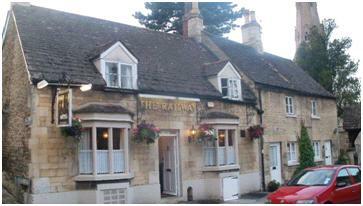 To step into the Railway Inn is like travelling in a distinctly unimaginative time machine. The scene is as described above. In order to further the unintended nostalgic feel, they have shunned the use of credit or debit cards, and decided to position their pub about 6 miles from the nearest cash machine. In fact the only subtle nod to the present day is in the form of a solitary book on the bar hilariously titled ’50 Sheds of Grey’. Presumably it’s one of the raft of books that Waterstone’s peddle only at Christmas – predictive text message mistake compilations, 101 funny gurns of Nicholas Lyndhurst etc. This book is undoubtedly the best and most interesting thing about this pub. I might be being a little harsh. This is a small pub in small village on a road that starts nowhere and goes to a place nobody wants to go (Leicester). I imagine it doesn’t get a lot of passing trade, so a couple of noisy merry-makers wandering in and asking to pay with fancy plastic money cards is always going to turn a few heads. But getting glared in a pub usually makes me want to leave pretty swiftly. Maybe I’m being soft. If you’re ever on your way to Leicester and for some reason can’t change your plans, it’s worth stopping in here for a pint and a read of their amusing literature. Otherwise, it isn’t worth the trip.